Beets keep for three weeks or so in the fridge (You should always cut the beet greens to an inch before storing and use the beet greens right away), so if you have any in the cool box waiting for inspiration, this is a simple dish that results in big flavor and gorgeous visuals. I think you will especially like the vinaigrette (and you can reserve some to use on salads later in the week; it really perks up a simple, seasonal fresh from the garden tomato and cucumber salad like the one I had today with a bit of feta). This became an instant top ten for my mom; we are all big salad eaters around here (except for my son, but nevermind; we’re working on it) but even those most dedicated herbivore needs a wake up for the taste buds. Beets and goat cheese have become a classic flavor combination with good reason, so don’t wait ’till you see it on a menu. DIY! Thanks to Adriana for inspiring this recipe in a comment on an earlier beet recipe (beets and greens with orange). https://hotcheapeasy.wordpress.com/2011/07/16/roasted-beet-salad-with-orange-and-beet-greens/. Preheat oven to 400°F. Wrap beets loosely in foil and roast about 40 minutes, until tender when pierced with a fork. Remove from foil and cool. When you can handle them easily, peel with your hands. You may want to use gloves or put your hands in a plastic bag to peel, as the beets stain fingers pink. Cut into small bite-size chunks. 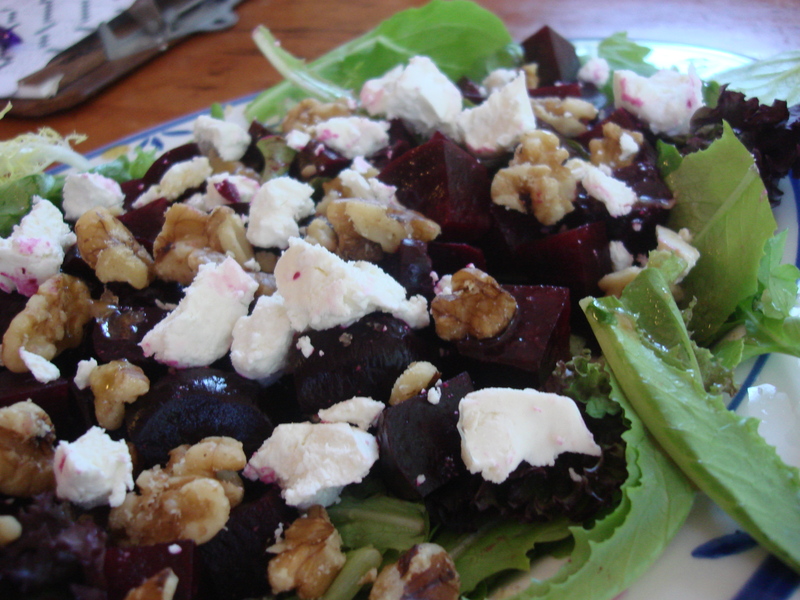 Lay a bed of salad greens on a plate, top with beet chunks, and optional red onion, walnuts and cranberries. Dot with goat cheese. Whisk all vinaigrette ingredients together in a small bowl. Drizzle over salad just before serving (You may want to pour dressing after the goat cheese to keep it from getting colored. You may also want to drizzle less rather than more to really enjoy the exciting flavors of the salad ingredients). There is nothing better than goats cheese and beetroot. I could eat it all day long. Lovely post. Me too! Love the sweet-tangy-creamy thing…. When I roast the beets I j pre-cut them and then just toss them with olive oil in a glass baking dish, some salt pepper and herbs, to roast uncovered. They do get browned a bit like potatoes and thus caramelized which adds to their inherent sweetness. Both methods would likely work well with this salad! Yummy! Will do this with my next roasted beets!